This beautiful bridge has so much history and charm, you almost want to jump into the picture and walk across the narrow snow filled path and listen to the sounds of nature. The bridge is in a beautiful location which may be remote somewhere. The woodlands surrounding the bridge are really pretty, with tall bare trees covered in snow. The water beneath the bridge is more than likely frozen over with cracks and you wonder what nature lived here before the Winter. 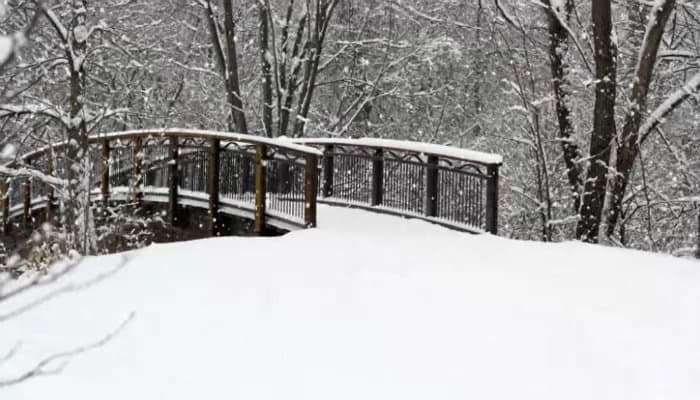 The heavy white blanket of snow leading to the bridge looks like the place has been unvisited and the soft white snow falling leaves you in wonder of this magnificent Christmas scene. Please feel free to view this design on our website and many more. You can add whatever message you like, along with adding a different design for your subsequent background pages. Your e Christmas cards for business are a great way to market your company and by sending this at Christmas time, you kill two birds with one stone as you have the added opportunity to thank you customers and wish them a very happy Christmas. Our corporate Christmas ecards are very versatile and you provide your clients with whatever information or message you like.